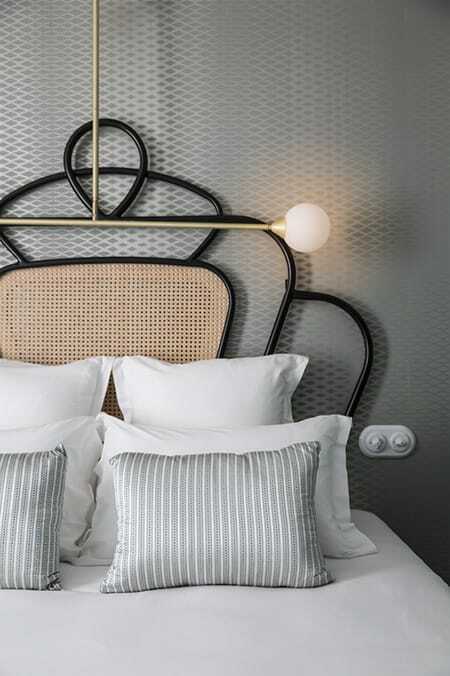 Hotels offer some of the most unique and interesting design inspiration in the world. Some of my favorites are overseas in Europe because of the fabulous history in the cities and architecture. 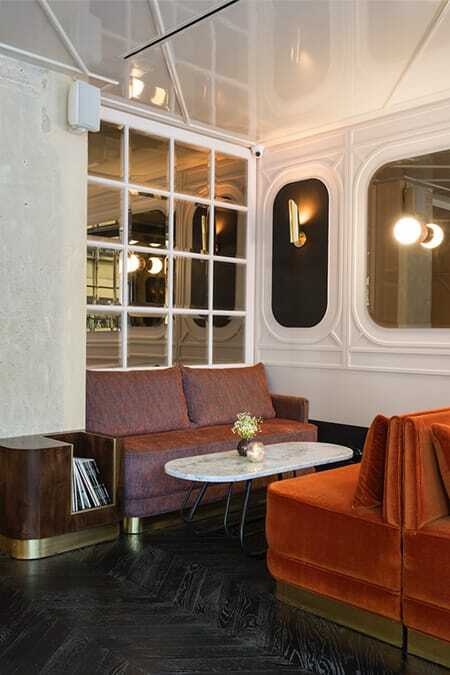 I recently discovered a particularly inspiring hotel in Paris aptly called the Hotel Panache. 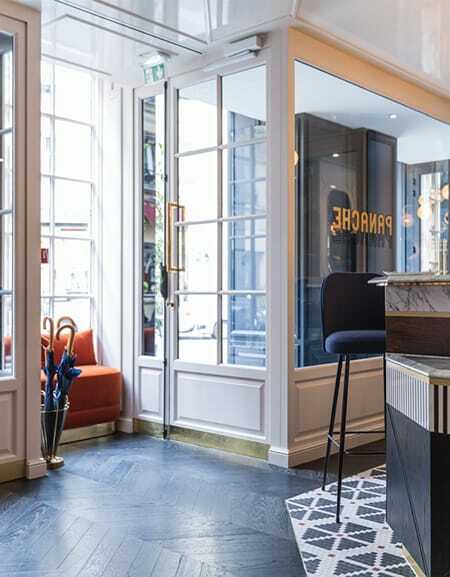 The designer, Dorothee Meilichzon, was inspired by the neighborhood and the architecture of the building, leading her to incorporate a lot of angles in the interior. 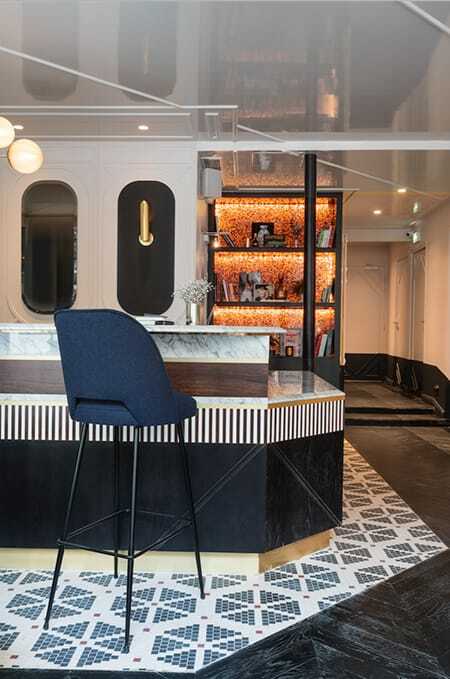 The result is a fantastic mixture of shapes and textures that come together to create a glamorous, mid-century modern experience. It’s inspiring to see the intentional way she used geometric shapes and lines to create interest, as well as how she brilliantly mixed different textures and colors for a dramatic yet elegant result. The entire hotel is something special. Enjoy this captivating hotel tour courtesy of Chzon. 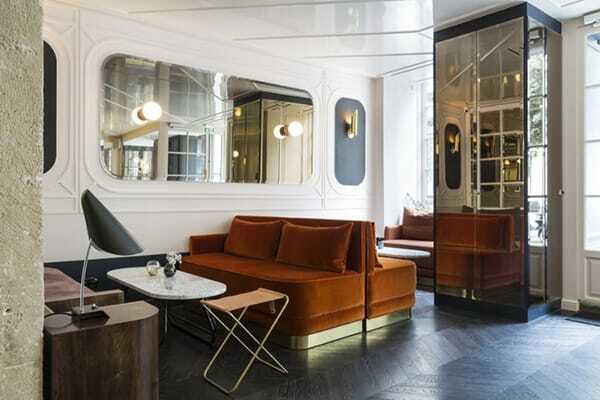 Mirrors and metallic finishes give the lobby a chic, art deco flair. Dark wood floors in a herringbone pattern and beautiful geometric tiles make even the floor a compelling part of the design. 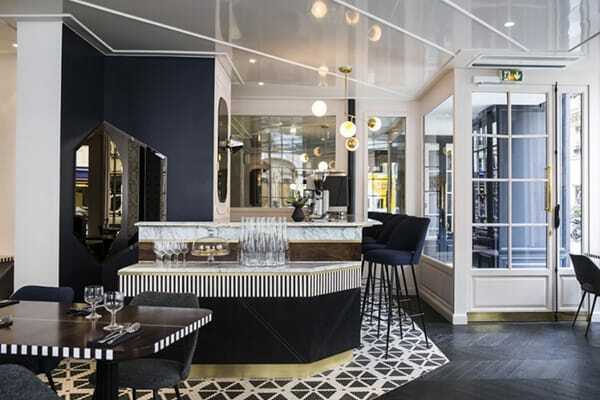 Black, white, and gold add a glamorous touch to the bar area that has a mid-century modern vibe. 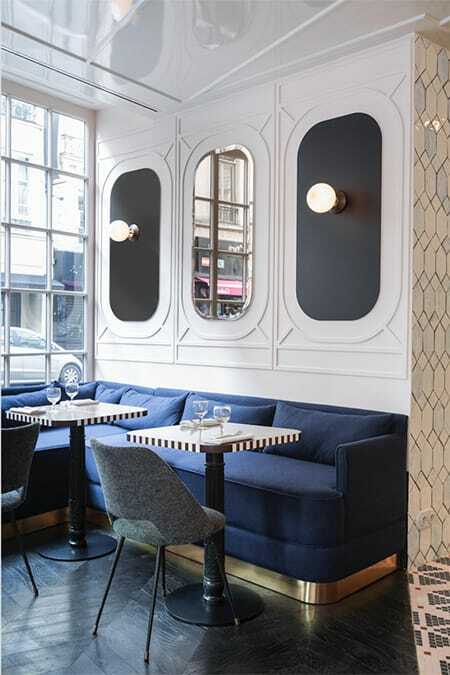 Dark blue seating brings a touch of color to the space that is rich yet comfortable. 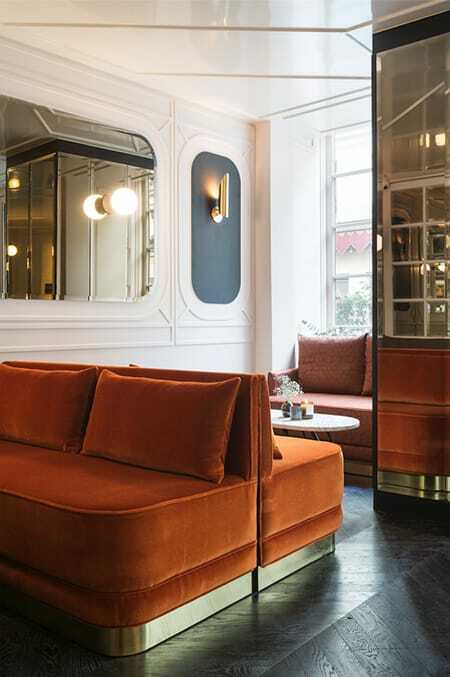 In another section, burnt orange seating in a luxurious fabric creates a stunning contrast to the white walls and dark floors. How captivating is that bookcase? Love how it looks like it is on fire. Several different textures come together in harmony to create a layered, visually interesting yet very cohesive space. Even the ceiling is special with a high-gloss, reflective white finish. 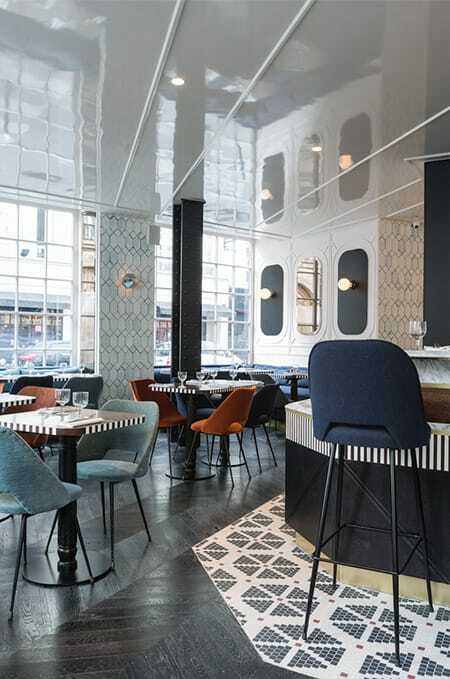 The rooms are more subdued with a relaxing grey palette but the shapes and beautiful textures continue. 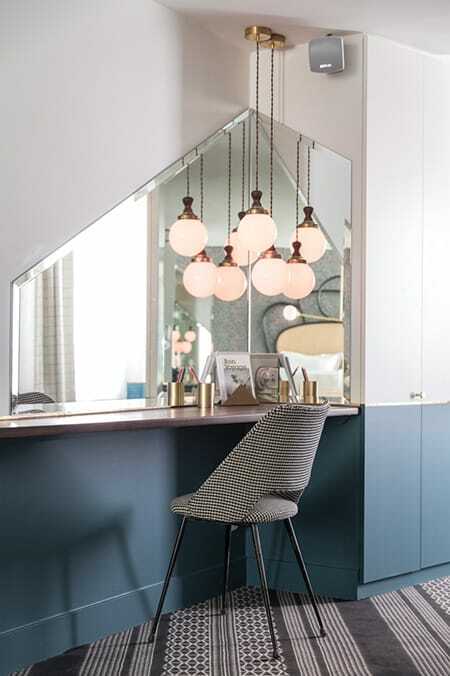 An angular mirror is contrasted by the round chandelier and again by the clean color blocking on the walls.